I recently replaced my “house” battery, and since those darn things are not cheap I wanted to take good care of it. In the Camper, there is a “converter” - it’s job is to supply 12 volts to the furnace, power to 12 volt outlets, and to charge the house battery when connected to AC (“shore power”). 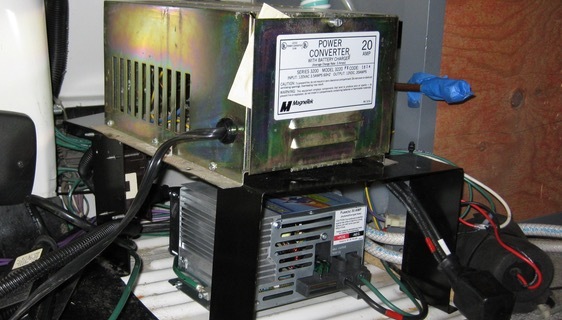 The stock converter is a Magnatek - a HUGE unit that provides very “dirty” (unregulated) 12 volts, as well as poor performance as a battery charger. I chose an Progressive Dynamics Intelli-Power model PD 9245C from Best Converter. It has a remote “pendant” for controlling the state of the charger (boost, normal, storage), which is easy to mount on the electrical panel. You will need some 1⁄8 inch thick by 3⁄4 or 1 inch wide aluminum (non-anodized) bar stock, hacksaw, drill, patience, an afternoon, and your favorite libation (for consumption when you are done). Disconnect your house battery and shore power and shutoff your propane before starting! Once you have the furnace out, remove the front bracket that the furnace was screwed to - notice that the mounting holes for the furnace are in the front of this bracket - you will need to remember this when you put it back! Now you have LOTS of room - notice how the Magnatek looks like a piece of WWII surplus gear? If yours is still working, you can use it to create a test power source for your Norcold bench test rig (upcoming project…). IMPORTANT! 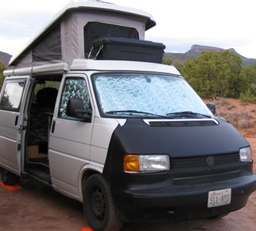 All the wiring in the “house” part of your van follows the same color codes as your home - black is HOT, green is ground, etc. Unscrew the front cover to the Magnatek and undo the 3 wire nuts that connect the Magnatek to your house wiring (umm… guys, wire nuts are NOT for use in vehicles…. jeez….). If you read the panel of the Magnatek, you will see that there are 2 hot and one neutral output - one hot is “filtered” (yeah, in your dreams…) and one is not. The “filtered” lead is the smaller one, and it supplies current to the 12 volt outlet near the fridge. SAFETY NOTE Fuses protect WIRES, not what the wires connect to - a device may (or may not) have internal fuses or other means to protect itself. If you connect a small wire to a large fuse, the wire could heat up from excess current, possibly causing a fire - long before the fuse would fail. Now you have one hot and one neutral wire - perfect for the Intelli-Power. Screw the Intelli-Power to the floor - also, screw in the old screws from the Magnatek to plug the unused holes - TIP: use some silicone around the screws to seal them up and minimize corrosion. As a side note, on my model of EuroVan, the line to the rear sprayer runs under the converter. We have never used our rear sprayer in almost 10 years, and I don’t like mixing electricity and water, so I removed the rear sprayer “T” connection to make it more tidy back there. When you connect the wires to the Intelli-Power - do not over tighten the terminals. You also want to wiggle the stranded wires after you think it is tight enough, and retighten. There is an inch pound torque value listed on the Intelli-Power - you will want to follow that. Make sure to test this BEFORE you put all the bits and pieces back together - maybe even run it for a few hours while you enjoy your tasty beverage, and put the pieces back on the next day! Check the voltage at one of the 12 volt outlets - it should be 13.6 while plugged into AC (may be up to 14.2 if your battery needs a “boost”), 13.2 for a “float” charge, and 12.8 or thereabouts when unplugged, depending on the condition of your house battery. The remote pendant indicates the “mode” the pendant is in. Here is some more info on the remote pendant: Progressive Dynamics.